This is a report of the performance of a four band trapped vertical that has been exposed to the weather for twenty five years. 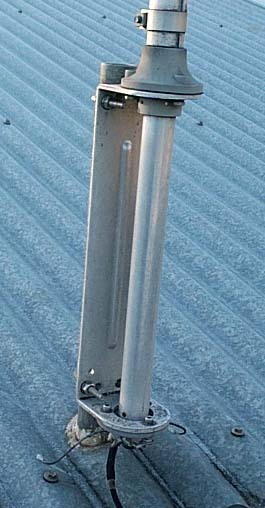 After five years of service, the antenna suffered corrosion of the plated steel fasteners, damage to the polypropylene trap caps from birds and degradation of the heat shrink cover on the 80m resonator. It was refurbished about twenty years ago and does not show signs of significant corrosion. VSWR tests using a Bird 43 directional wattmeter and resistance tests indicate satisfactory electrical performance. The antenna has been deployed at Canberra, an inland location with light rainfall and temperatures ranging from -8°C to 40°C and essentially no industrial air pollution. This is the mounting bracket which is in quite good condition, the insulators are in good condition and there is no sign of significant corrosion. The black marks are lichens which wash off with a high pressure hose. It was refurbished fifteen years ago by fully dismantling it and replacing all the plated steel fasteners with 316 stainless fasteners (including the main element connection bolt). I should have replace the brass clamp screws with stainless cap screws for the convenience of a smaller, safer adjustment tool. 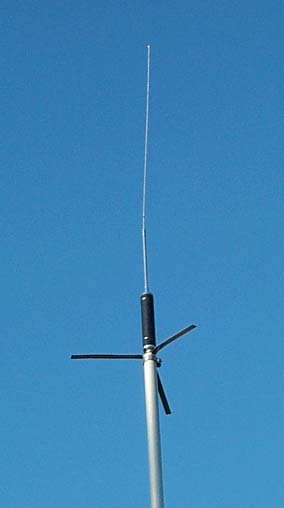 The short coax tail at the base of the antenna links to RG213 under the roof. The end is sealed with hot melt tape and heat shrink tube. It has not been subject to bird attack, but the coax degrades in the sun and needs replacement every ten years. The traps were damaged by birds after only a few years service, they had destroyed the polypropylene caps at the top of the traps. This had allowed leaf litter, spiders webs, insects and water to accumulate in the trap housing which would quickly lead to degraded performance and more permanently, corrosion. Replacement trap caps were made from standard white PVC pressure pipe caps by drilling a hole in the caps for the element, trimming the caps in length and machining a small rebate so that the cap fits inside the aluminium tube which encloses the trap. The replacement traps were fitted with a neutral silicone sealant to the main element. The sealant is not intended to seal the enclosure, but holds the caps in place (they may otherwise 'walk' up the tube with flexing of the antenna). They have been in the weather for 25 years without external sign of significant deterioration. The brass screws and stainless clamps were in good condition. This is the 80m mobile resonator and capacity had on top of the 40m section. Birds attacked the original grey heat shrink plastic covering the resonator coil within months of erecting the antenna. The heat shrink was replaced with a quality black heat shrink about 25 years ago and is in good condition. The bend in the element is caused by birds that cling to the top of the element and cause it to bend back so that the top is lower than the coil. The 3mm stainless used is not substantial enough to resist this damage. an 80m resonator that is designed for higher power and physically stronger, perhaps tube rather than the 3mm stainless whip.